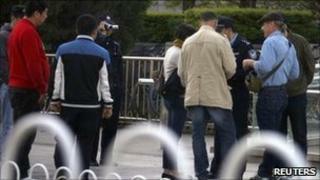 At least 20 Chinese Protestants have been detained as they tried to gather for an Easter service in Beijing. The worshippers, from the Shouwang church, were trying to hold an outdoor service because they are prevented from using their own premises. Police have recently arrested dozens of people from the church. The authorities have also been carrying out a wider suppression of dissent - harassing foreign reporters and detaining lawyers and activists. The most high-profile detainee, artist Ai Weiwei, was taken by police as he tried to board a flight earlier this month. His family say they do not know where he is, whether he has been charged with an offence, or even whether he has been formally arrested. China's constitution guarantees freedom of religion, but the Communist Party tries to control where people worship. There are an estimated 70 million Christians in the country, about 20 million of whom attend government-approved churches. The rest worship with unregistered groups known as "house" churches. Such groups are broadly tolerated, but Shouwang leaders have annoyed the authorities in recent weeks by insisting on trying to hold services in the open. Shouwang is one of Beijing's biggest so-called underground Churches, with more than 1,000 members. The BBC's Damian Grammaticas in Beijing says police personnel were on every street corner in the area where the worshippers were due to meet on Sunday morning. He says the authorities rounded up anyone suspected of being a member of the Shouwang church and loaded them on to buses to be driven to police stations. One of the church's leaders Jin Tianming, who is under house arrest, told AFP news agency that between 20 and 30 members had been detained. He said they had been taken to several different police stations. About 100 Shouwang members were held earlier this month, and 12 of its leaders are under house arrest. Bob Fu, of the US-based Christian China Aid Association, says the crackdown on Christian worship is wider than Beijing. He says churchgoers in the southern city of Guangzhou have been refused permission to hold Easter services, and Christians in the northern city of Hohhot are facing repression. "There is a very large house church in Hohhot. They were also under crackdown. More than a dozen of the leaders are now under criminal detention," said Mr Fu, who is a critic of Beijing's religious policies. The authorities have not yet commented on the latest detentions.